You may already know from our Facebook page or other sources that Bar Globe World is back up after being down for a little while. The truth is, there were some technical issues that our web hosts could not (or I’m guessing more like would not) resolve, so we decided to part ways. We have several new bar globes on offer, and even entire new bar globe collections by the Italian manufacturer Zoffoli. But we will be sure to write a separate blog post to tell you about those. 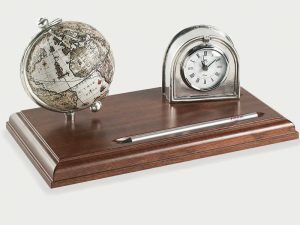 Unfortunately there are also some discontinued products like this Pewter Desk Clock with 16th Century Replica Globe. You can find this and other clearance or marked down globe products in our Sales and Deals section – a page you should visit often to make sure you don’t miss out. We actually only have one pewter desk clock left, even the manufacturer Zoffoli doesn’t have any, so if you like it you should hurry and grab it! Our website is now on WordPress, just like this blog, and we’re really happy about it – we make all the decisions about what our website can and can’t do. No more web builders for BarGlobeWorld.com – we are going to have what we need on our website and we won’t have to deal with “sorry, that can’t be done.” Now if we don’t have it, it’s our own fault and there’s no blaming anyone else. Saying that, we are pretty new at this so please let us know if you encounter any technical or other issues. For that matter, we would appreciate if you simply browse through the new Bar Globe World site and design and let us know what you think – we want all opinions, good or bad. You can be blunt if you want, we promise we can take it.